D series wall-mounted touch panel controller -single zone series is widely installed in commercial / office/household. Range from Single color/ CT/RGB/RGBW four types. Applies for various kinds LEDs. D series touch panel controller absorts the best controlling technology from other manufacturers. to provide users with more superior items. 1 simple fashion and decent appearance design. 2 Unique structure, super easy to install/remove. 3 high accuracy touching IC+special post-processing ,the touching accuracy is highly strengthened. 4 Fool type operation, easy to use. 5 Touching along with chord music & LED indicator. Visual & Auditory & Touch 3 layers to feel the light-changing synchronously. 6. 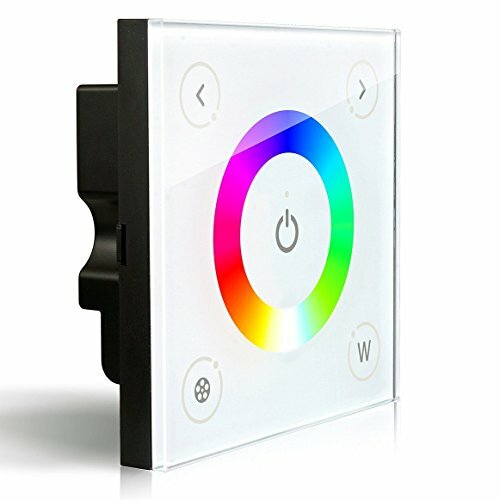 Pioneered T-PWM dimming technology+ 4096 gray scale makes an almost perfect dimming/ color-mixing performance. Professional shell design combined with sealed PCB, super easy to install & remove. Press to turn on/off the white LEDs. Long press to change the brightness.